Can you save the entire elven empire from falling into the hands of Il-Lydia, an evil night elf? Play - and re-play! 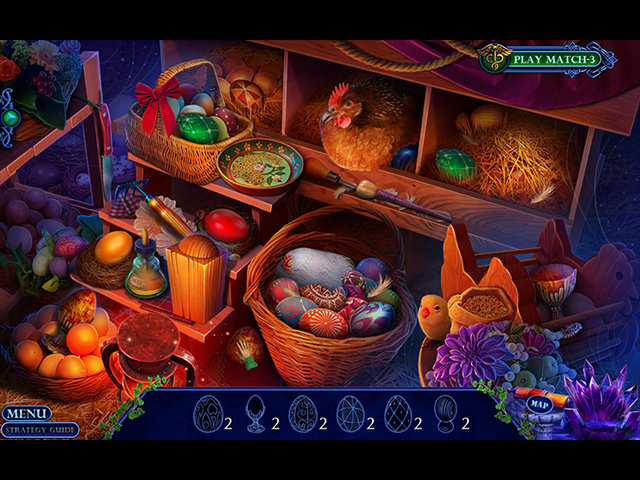 - more challenging Hidden-Object Puzzles and mini-games! Find and collect all the cards of Elven Healing, all the examples of Eleven Artifacts, and use gold leaves to purchase the tools of Alchemy! Download original concept art, wallpapers, and soundtracks. Always know where to go with the helpful Strategy Guide! 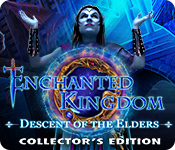 Enchanted Kingdom: Descent of the Elders Collector's Edition is rated 4.1 out of 5 by 15. Rated 5 out of 5 by Stamo from Best Enchanted Kingdom ever! What's not to like about this game? Excellent colour palette, nice graphics, interesting storyline, no technical problems at all. Thank you Domini for this very long, most enjoyable Enchanted Kingdom I have ever played! Rated 5 out of 5 by ender07 from Could not stop playing! WOW! This game is a real treat after playing several darkly themed games in a row. It is packed with a variety of HOGs, objects to find including elven artifacts (morphs), a large number of puzzles, small to larger more complicated ones AND folks, you can play a match 3 instead of the HOG or a puzzle. I love this as I'm not good at every kind of puzzle. This is the best game IMHO all winter. Thanks BF and Domini! Rated 5 out of 5 by jennsmom from Thank you Developers I've enjoyed this game more than any of the previous in the serieis - which is one of my favorites. Why? Because of the Match 3 option for almost everything! I am rarely interested in it for HOs, but some of the puzzles in this series, are ones that I hate, and to have a Match 3 option, is great. Also, the "diagnostic" tool is much improved. I liked the story line for both the main game and the bonus, which thankfully, is NOT a "prequel." The colors are acceptable, the music is unobtrusive and makes a nice background sound. Puzzles range from easy to medium, and I enjoyed the HOs. I think that Match 3 option for puzzles is terrific. I hope to see it in other games. Rated 5 out of 5 by shahynaz from loved the game i always enjoy enchanted kingdom series and i enjoyed this one as well thank you so much!! Rated 5 out of 5 by p2668 from Loved It Well, I'm a puzzle lover, so this is a game for me. There are a lot of new puzzles too, that I find a lot of fun. Rated 5 out of 5 by sunnyglow from A MAGICAL GAME PROVIDING AN ANTIDOTE FOR THE WINTER DOLDRUMS REVIEW BASED UPON THE ENTIRE GAME 5 Chapters Plus a Bonus Chapter – Strategy Guide: 53 Pages OVERVIEW: The Tar Empire is once again in peril. After 700 years, the flying elven kingdom has returned, inflicting humans with a deadly plague. As a healer of the Medico Imperium, you must find an antidote to save your kingdom. With an impending battle re-emerging between the elves and humans, you must not only find an antidote, but also find the party responsible for the conflict. Confront an evildoer who will stop at nothing to destroy mankind and the elf kingdom to rule the Tar Empire. Can you defeat this evildoer and bring peace between both kingdoms? OPINION: I LOVE Domini games. I always feel I get more game for the money than from some other developers. Although this is not my favorite series from this developer, this is an outstanding game! The pace is excellent with plenty of activities to keep a player involved in the game. The story is well-written. The graphics are realistic, although I wish Domini would tone down the overuse of purple and neon green in their games. Most of the game centers on diagnosing illnesses and then creating antidotes for those illnesses. MECHANICS: There are four (4) levels of play including a customized version. There are twenty-one (21) achievements. Collect fifteen (15) cards which deal with illnesses, fifteen (15) morphing elven artifacts, and fifty (50) metal leaves used to purchase items for your laboratory. There is a bar at the side to indicate if there are one or more collectibles within a scene. I found the items easy to locate. 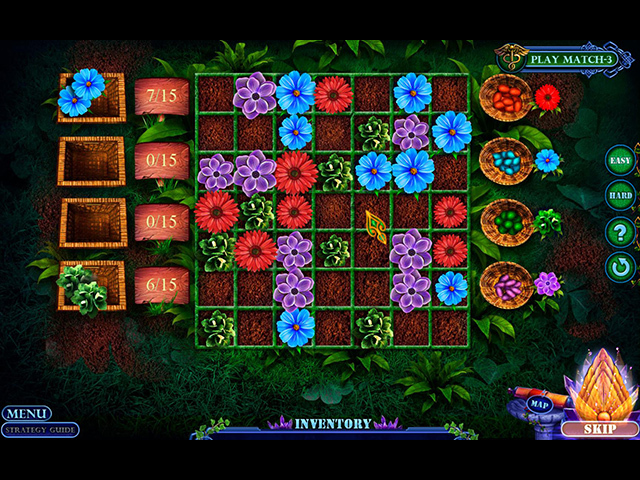 As in all their games, Domini provides an option to play the puzzles in either an “easy” or “hard” mode within the menu. There are ten (10) wallpapers along with concept art and music and video sequences.You can replay seventeen (17) HOP scenes and twelve (12) mini-games. In this game you have the option to play a Match-3 game in lieu of not only the HOP scenes, but the mini-games as well. This is a new feature I have not seen before in any other HOP game. BONUS CHAPTER: It is a different story. Surprisingly, I like this story better than the one from the main game. Play Jarolia, another healer within the realm. You are off to save the Elven people from an evil elf healer, Il Lydia. She is out for revenge, turning all the elves into nocturnal creatures, night elves, making them her servants. I feel this chapter is worth the extra money for the collector’s edition. You continue to collect all the collectibles within this chapter. There are nine (9) mini-games and five (5) HOP scenes. HOP SCENES: There are nineteen (19) of some of the most creative HOP scenes I have played in some time. They are very interactive and vary in design. They include scenes with only morphing objects. There is one with sliders in which you must align two silhouettes to remove an object. There are rebus clues, storybook scenes with items which must located and then returned to their proper location. There are very few straight lists of items. However, even within the lists of items, there are creative touches within the scenes. 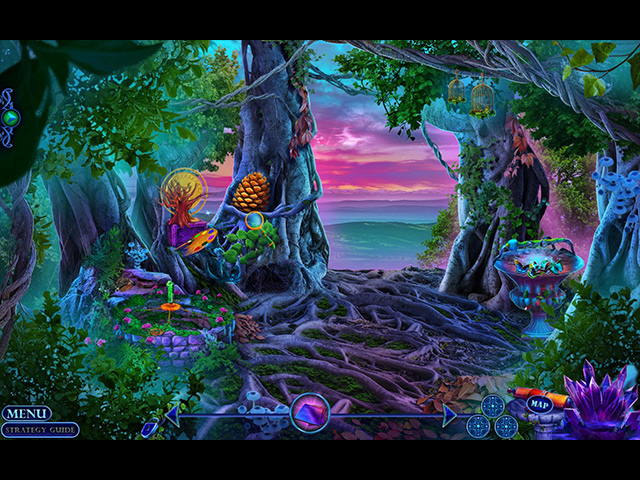 Some of the scenes have puzzles within them. MINI-GAMES: There are thirty-three (33) mini-games within this game. This includes seven (7) Rube Goldberg mini-games which contain three (3) puzzles each. You will play a Rube-Goldberg puzzle with each diagnosis you make. In lieu of the puzzles you can play a Match-3 game instead. Most of the puzzles have the choice to be played in either a “hard” or “easy” mode. You can change this designation while playing the game even if you have opted for one or the other within the menu. SPOILERS: THESE ARE SOME OF THE MINI-GAMES AFTER THE DEMO: A. Diagnostic mini-game: (1) Switch puzzle. On a grid, switch tokens so they are placed in the same row as a matching one at the side the grid. (2) Assembly puzzle. Move four hands attached to a skeleton so that each hand is placed squarely on an imprint of a hand at the sides. The hands are jointed. (3) Variation of the bar removal puzzle. Move green gems within a grid to create a path so that a red gem can move from the left to the right side of the grid. B. Itsy Bitsy Spider. Sequence puzzle. On a grid move colored spiders up-and-down until they are situated in a row with a matching colored gem. Moving one spider affects the others. C. Maze puzzle. Lead a griffin through a maze to the elven castle using the wind power of tornadoes to guide it through the paths. Avoid falling rocks as you cross. D. Beat the computer. Move your tokens so you end up with more tokens than the evildoer. Jumping over them or abutting them changes them to your color and vice versa. BONUS CHAPTER E. Connection puzzle. Connect stars with lines so that the number of each star matches the lines emanating from it. F. Sequence puzzle. Put out 4 fires using buckets of water. All flames must be extinguished at the same time G. Mathematical puzzle Move a horse to the middle of a grid by pressing numbered buttons indicating the direction and number of steps you can proceed. You must not land on obstacles in your path. H. Logic puzzle. Place flower seeds in a row so that there are at least three of the same type of flower in each row and column. Rated 4 out of 5 by dancemom1 from Sorcery, Griffins, potions! Hello friends! As always, I review mostly on the game play and leave the story line to others who do a much better job than I. I believe this makes #5 in this wonderful series. Game play was excellent, with no problems during the demo. Graphics are quite well done, even with a bit of blur here and there. Seems to be the norm these days, so not sure why I keep commenting on it. The colors are very bright, but for the most part, are not over powering. Some do seem a little brassy, but not a game changer. Animation is well done and lifelike, with eye and facial movements. The constant body swaying is a little off putting, but not too bad. Music is soothing, and does move with whatever is happening at the time. Voices are nice and are age and character appropriate, with urgency, fear, anxiety, etc. Sound FX are nice, when we have them, but are not constant. HOPs are varied and well done, with interactive silhouettes, highlighted words, interactive lists, slider bar picture match and match picture pieces. Scenes were fairly clear and items were not difficult to find. You can switch to a match 3 if you prefer. Puzzles were fairly simple, but you can choose between easy and hard. I always demo a game in the easy mode to get a feel for it, then go back and replay in hard. I like that you can eliminate the skip time completely. Yes, still has the perfect map. Areas clearly identified by name and picture and it will show you where a collectible was missed, if you choose that feature. The hint system is very helpful. We do not have the transport feature as such. However, the map does open and show you where you need to jump next. There is a lot of back-tracking, so this is a big time saver. We have many collectibles, which I really like in a CE game. We need to find 15 cards, which can be easily missed, as they are laying around anywhere; 15 Elven artifacts, which also morph and are not as easy to spot as you think. These can be just about anything and are often a bit small. We also have to find 50 metal leaves. So far, they have been fairly large, but you just have to remember to look for them. Again, we have the healing ability and the use of a diagnostic Scepter used to examine the body. With each body part that is analyzed, we have a simple puzzle. This was boring and unnecessary to me, so I actually skipped most of them. The plus is that it only skips the part you are currently on, and not the entire exam. Once our exam is finished, we find the items needed to make our healing potion. Making the potion was not as much fun as in previous games in this series, and not much action either. Anyway, they are healed and we are off to find someone else who needs help. This game is not challenging, and the story is nothing new, but I do like this series. I think all levels of players will find this one interesting. Gave this one a 4.5 on my scale. Yes, I am adding it to my collection. As always, try it for yourself and see what you think. We all have different tastes in games and you may not care for this one at all. Thanks for the reviews. Play on!